Note: U.S. Government documents are in the public domain and may be freely distributed so long as content is not changed. This document is being made available for the convenience of RF Cafe visitors. 1945 -- Isidor Rabi, a physics professor at Columbia University, suggests a clock could be made from a technique he developed in the 1930's called atomic beam magnetic resonance. 1949 -- Using Rabi’s technique, NIST (then the National Bureau of Standards) announces the world’s first atomic clock using the ammonia molecule as the source of vibrations. 1952 -- NIST announces the first atomic clock using cesium atoms as the vibration source. This clock is named NBS-1. 1954 -- NBS-1 is moved to NIST’s new laboratories in Boulder, Colo.
1955 --The National Physical Laboratory in England builds the first cesium-beam clock used as a calibration source. 1958 -- Commercial cesium clocks become available, costing $20,000 each. 1960 -- NBS-2 is inaugurated in Boulder; it can run for long periods unattended and is used to calibrate secondary standards. 1963 -- The search for a clock with improved accuracy and stability results in NBS-3. 1967 -- The 13th General Conference on Weights and Measures defines the second on the basis of vibrations of the cesium atom; the world’s timekeeping system no longer has an astronomical basis. 1968 -- NBS-4, the world’s most stable cesium clock, is completed. This clock was used into the 1990s as part of the NIST time system. 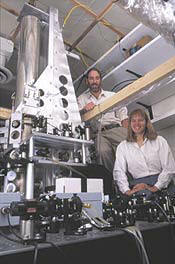 1972 -- NBS-5, an advanced cesium beam device, is completed and serves as the primary standard. 1975 -- NBS-6 begins operation; an outgrowth of NBS-5, it is one of the world’s most accurate atomic clocks, neither gaining nor losing one second in 300,000 years. 1989 -- The Nobel Prize in Physics is awarded to three researchers -- Norman Ramsey of Harvard University, Hans Dehmelt of the University of Washington and Wolfgang Paul of the University of Bonn -- for their work in the development of atomic clocks. NIST's work is cited as advancing their earlier research. 1993 -- NIST-7 comes on line; eventually, it achieves an uncertainty of 5 parts in 10 to the 15th power, or 20 times more accurate than NBS-6. 1999 -- NIST-F1 begins operation with an uncertainty of 1.7 parts in 10 to the 15th power, or accuracy to about one second in 20 million years, making it the most accurate clock ever made (a distinction shared with a similar standard in Paris). Why are Cesium atomic clocks used? Since 1967, the International System of Units (SI) has defined the second as the period equal to 9,192,631,770 cycles of the radiation which corresponds to the transition between two energy levels of the ground state of the Cesium-133 atom. This definition makes the cesium oscillator (sometimes referred to generically as an atomic clock) the primary standard for time and frequency measurements. Other physical quantities, like the volt and meter, also rely on the definition of the second as part of their own definitions. Atomic clocks are quite complex, but the basic theory is simple. Like all clocks, they are intended to make the same event happen over and over. The repetition of this event produces a frequency, which is intended to be as stable as possible. For example, the pendulum in a grandfather clock swings back and forth at the same rate, over and over. The swings of the pendulum are counted to keep time. In a cesium oscillator, the transitions of the cesium atom as it moves back and forth between two energy levels are counted to keep time. The best cesium oscillators (such as NIST-F1) can produce frequency with an uncertainty of about 1 x 10-15, which translates to a time error of about 0.1 nanoseconds per day. Why must time be measured so precisely? Precise time synchronization has many uses in everyday life. Synchronization between two or more locations is necessary for high speed communication systems, synchronizing television feeds, calculating bank transfers, and transmitting everything from email to sonar signals in a submarine. Power companies use precise time to regulate power system grids and reduce power losses. Radio and television stations require both precise time-of-day and frequency in order to broadcast programs. Precise time measurements are also essential for accurate navigation and the support of communications on earth and in space. Scientific organizations such as NASA depend on reliable and consistent time measurement for projects such as interplanetary space travel. Fractional disparities in times between a space probe and tracking stations on Earth can dramatically affect the positions of spacecraft. Precise time measurements are also essential to radio navigation systems like the Global Positioning System (GPS). By synchronizing the satellite clocks within nanoseconds of each other, it makes it possible for a receiver to know its position on earth within a few meters. Who Needs High-Accuracy Timekeeping and Why? High-accuracy timekeeping is critical to a number of important systems, including telecommunications systems that require synchronization to better than 100 billionths of a second and satellite navigation systems such as the Defense Department's Global Positioning System where billionths of a second are significant. Electrical power companies use synchronized systems to accurately determine the location of faults (for example, lightning damage) when they occur and to control the stability of their distribution systems. In the domain of space exploration, radio observations of distant objects in the universe, made by widely separated receivers in a process called long-baseline interferometry, require exceedingly good atomic reference clocks. And navigation of probes within our solar system depends critically on well-synchronized control stations on earth. Time is also important in the ordering of many human activities including the activities of financial markets. Time/date stamps are used to identify transactions so that these can be placed in order, a process that is becoming increasingly important as commerce moves electronically at faster and faster speeds. The need for good timing in this area is emphasized by a recent Securities and Exchange Commission-approved rule of the National Association of Securities Dealers that requires all member brokers synchronize their time stamps to NIST. The time-related quantity called frequency, basically the rate at which a clock runs, is needed by the radio and television broadcast industry to maintain proper control of transmissions and thus avoid interference between stations. Frequency is also the basis for many electronic systems such as event counters, and many physical quantities such as length, voltage, pressure, and so on are often transformed to frequency, since frequency is a quantity that can be measured with very high precision. How Does NIST Support These High-Technology Requirements? The most fundamental way in which NIST supports such commercial activities is through its traditional role in providing the very accurate measurements needed to assure that specifications of high-technology equipment can be trusted. In fact, most countries would not accept United States high-technology exports without a guarantee that the specifications for this equipment are based on measurements that are traceable to NIST, which must then be sure that these measurements are compatible with those of the rest of the world. So, one key use of this new standard is to serve as a reference for supporting specifications for equipment manufactured in this country. Beyond this fundamental mission role, NIST works to distribute timing signals to a wide range of users through the Internet, by telephone, through radio broadcast signals, and by means of very precise signals distributed by satellite. The usage of NIST's Internet Time Service, now receiving more than 500 million calls per year, is growing extremely rapidly. Radio time broadcasts from stations WWV and WWVB are used to set a large number of clocks; in fact, there is a growing list of consumer products (desk clocks, wristwatches, etc.) that use these radio broadcasts to maintain accurate time and even handle daylight saving time changes automatically. At the highest level of accuracy, NIST supports scientific studies, the space program and the development of advanced timing equipment by delivering timing signals using satellite transfer methods.